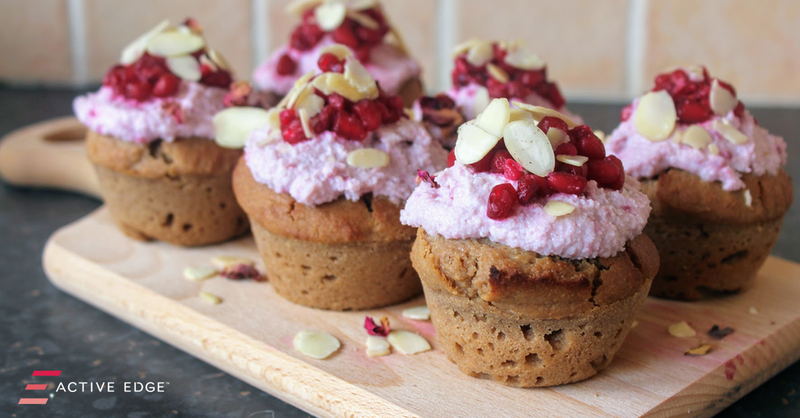 SpamellaB Has created these fantastic muffins featuring our PomegranateActive concentrate. Perfect as a healthy way to indulge innocently. Preheat the oven to 180C and lightly grease a 6-hole muffin tin. Mix together the ground almonds, flour and baking powder in a bowl. Whisk together the yogurt, coconut oil, maple syrup, vanilla and PomegranateActive then pour into the dry ingredients and mix to combine. Spoon between the muffin holes to fill then bake for 15-20 minutes until risen and golden. Leave to cool. For the topping simply beat the ingredients together until quite thick. Once the muffins have cooled, spoon over some of the topping to cover then scatter over the pomegranate seeds and flaked almonds. Enjoy!